JoAnn Corley-Schwarzkopf | NewSchool Management: Did You Know Your Employees have a Natural BS Detector? Did You Know Your Employees have a Natural BS Detector? Your employees have a built in, natural "BS" detector? Did you know that? That's why communicating with candor is essential for management and leadership effectiveness. Candid, direct communication is confusing for many because I think (and you can tell me in the comments how this sits with you) its something that many leaders and managers misunderstand. Many see being candid or direct as mean or rude, vs. helpful truth telling. I've observed many have come to this view because when candor is experienced it's done in a way that feels harsh, mean or tactless... and they certainly don't want to be that way. And yet, succumbing to this experience of candor creates a missed opportunity to build trust, credibility, and influence as a leader. According to Judith Glaser, author of the book Conversational Intelligence (a must read by the way), candor builds trust. In fact it's one of the keys to a high-performing team. "Through our research and client projects over the past decade, we have identified that candor is the behavior that best predicts high performing teams and the single most important success factor in transformation and change. Organizations that exhibit high levels of candor produce the highest and most successful performing teams.....by setting the context for candor throughout all of your leadership interactions, you level the playing field. same networks in our brain. When we display the Prefrontal Cortex, our Executive Brain. 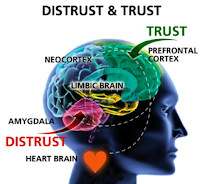 This network opens the power of the Executive functions, such as strategic thinking, empathy, foresight, intuition, good judgment and handling uncertainty with less fear. So candor plays a role in elevating our capacity to work through difficult challenges with others – a core activity for change and transformation in organizations." "Candor is a door to tapping wisdom and for discovering new ways to handle the challenges we face when stakes are high and uncertainty abounds." The key point is what you say and how you say it both matter! What this also means is your employees can tell when you're not being candid, truthful, authentic or transparent. Their brain in wired to detect and distrust BS. The result? Your ability to influence, to get the best outcomes will be diminished. Here's two suggestions for all leaders related to candor. 1). Examine your own understanding and relationship to it. Adjust your understanding accordingly and practice it. 2). If you're really having a challenge embracing it or in your delivery style - read the book Radical Candor: Be a Kickass Boss Without Losing Your Humanity. // JCS Business Advisors is a holistic business growth consultancy. Through our expertise in human behavior, we partner with forward-thinking senior leaders, entrepreneurs and their HR counterparts to bridge the knowledge & execution gap of connecting people, performance, and profits, resulting in high-performance leadership teams and increase profitability. // Email: joann@jcsbusinessadvisors.com // Ph: 888.388.0565 // Schedule a complimentary advisory call and receive a copy of our latest executive briefing. Learn about our "all-in-one" system that develops competent leaders and managers, minimize employee problems while profitably growing your business.